The weekend's biggest parties, exhibition openings, shows and book launches. A three day indie music festival across various venues, including 12 x 12, De Commune, Live Cube (Okinawa Kinjo) and more, with a lineup of local and international sound and visual artists, from Japan's cult psych-rock outfit Acid Mothers Temple & The Melting Paraiso U.F.O., to Finnish saxophonist and electronic musician Jimi Tenor. Early bird B2,000, available here. Prateep Suthathongthai showcases his paintings and videos on the roots of Isaan's scoietal problems. Dance therapist Dujdao Vadhanapakorn collaborates. Nov 22, 2018 - May 5, 2019, 6pm. 100 Tonson Gallery, Soi Tonson, Ploen Chit Rd., 02-010-5813. Jon Shaban, the folk rock artist and songwriter performs in Bangkok for the very first time supported by John Will Sail, Pree Asvaraksha, and Karin Kraus. Nov 22, 8pm. Bad Burger Bangkok, Sukhumvit Rd., 095-249-8386. Before heading to Big Mountain Music Festival, J-pop band Five New Old perform their unique mix of pop, rock and R&B with an 80s vibe together with Moving and Cut, Plastic Plastic and Safeplanet. Nov 22, 7:30pm. PLAY YARD By Studio Bar, Ladprao Soi 8, 085-146-8017. B300 on entry. Siwilai City Club presents a two-day party dedicated to molam music, headlined by esoteric British DJ and producer Four Tet (Nov 23), and Jurassic 5’s DJ Nu-Mark (Nov 24). Local favorites include Paradise Bangkok Molam International Band and Toomturn Molam Group, who'll welcome to the stage iconic molam performers Angkhnang Khunchai and Kwanjit Sriprachan, respectively. Nov 23-24, 6pm. Siwilai City Club, 5/F, Central Embassy, 02-160-5631. From B990 on Ticketmelon. When Made by Legacy returns this Nov 23-25, the hit flea market inspired by Williamsburg in Brooklyn will take place at Sanampao's Royal Stable Unit during the Princess' Cup Thailand 2018 horse race. Browse through well-worn fashion ware, home furnishings and arts and crafts while watching the races..
Nov 23-25. The Royal Horse Guard. BTS Sanam Pao. Techno and house music provided by DJ Dan Buri, new in the scene Linus, and one Kolour crew member ATMA. Nov 23, 10pm. Mustache Bangkok, Ratchadapisak Soi 7, 064-814-5933. Free before midnight. As part of the International Dance Festival, this group from Jerusalem brings their show about issues taking place in the Middle Eastern city. The show reflects attitudes towards peace, humanity and hope. Nov 23, 7:30pm. Bangkok Art and Cultural Center (BACC), Rama 1 Rd., 02-214-6631. Making reservation on Ticketmelon. Rising Korean DJ Midori performs her EDM set in Bangkok. Nov 23, 10pm. Insanity Nightclub, Sukhumvit Soi 11, 082-731-8885. Male B400/ Female B300 (both include a drink). This creative event challenges participants to reduce, reuse and recycle in creative and resourceful ways. There's a B200 deposit for entry that gets refunded after the event. Nov 23-25, 10am. Bangkok Art and Cultural Center (BACC), Rama 1 Rd., 02-214-6631. Register on Greenpeace.org. A number of artists and designers will set up their ateliers and host workshops and stalls, with music from DJs. Nov 24. The Commons, 335 Thonglor Soi 17, 089-152-2677. Free. 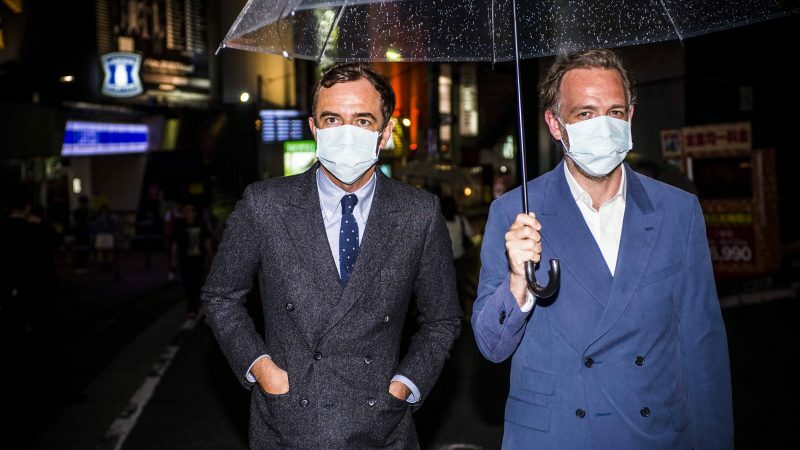 SixSix have announced that the internationally renowned Belgian brother duo, 2ManyDJs, will be coming to Bangkok, with support from KNATZ. Expect captivating audiovisuals and music ranging anywhere from progressive rock and funky R‘n’B to trip hop and German techno. Nov 24, 9pm. Live Arena, RCA, Petchaburi Rd. B690 on Ticketmelon. Cat Radio’s leading two-day Thai music festival returns with six stages hosting over 100 mainstream and underground artists—Wednesday, Greasy Cafe, Jelly Rocket and many more—plus a ton of pop-up stores. Follow the official Facebook page for promotions and deals. Nov 24-25. Wonder World Extreme Park, 86/1 Khubon Rd. B1,500 on Thaiticketmajor. FAIR: Sam Praeng Facestreet Alive! The Sam Praeng neighborhood (comprised of Praeng Nara, Praeng Suppasart and Praeng Phuthorn streets) will be filled with local workshops, live musics, shows and various food stalls. Nov 24-25, 1:30pm. Sam Praeng community, Praeng Nara, Praeng Suppasart, and Praeng Phuthorn Rd. Expect trap and hardstyle from Holland duo DJ LNY TNZ. Nov 24, 9pm. Demo, Thonglor Soi 10, 085-250-2000. Another edition of Cinema Diverse: The Invisible Hands features four selected films beginning with the Phantom of the Opera, as chosen by colorist Kritsada Kaewmani. Nov 24, 5pm. Bangkok Art and Cultural Center (BACC), Rama 1 Rd., 02-214-6631. B60 on entry. ART: The Truth of the Matter(s) is. Explore core of matter through this metal work series created from steel copper, and aluminum. Nov 24 - Dec 23, S.A.C. Subhashok The Arts Centre, Soi Phrom Chit ,Sukhumvit Soi 39, 02-662-0299. Join the launch of the English edition of The Blind Earthworm in the Labyrinth, the debut novel from award-winning author Veeraporn Nitiprapha. Winner of the 2015 SEA Write Award, The Blind Earthworm in the Labyrinth tells the story of Chareeya, a young girl growing up in a lush riverside town on the outskirts of Bangkok, whose life is disrupted when she and her sister meet the orphan boy Pran. Both the author and the novel's translator, Bangkok Post film critic Kong Rithdee, will be present at the lanuch to answer questions and sign copies. Nov 25, 3-5pm. Open House Bookshop by Hardcover, 6/F Central Embassy, 02-160-5949. Free. Progressive rock group Polyphia performs live in Bangkok together with special guest Marty Friedman and an opening act from 9th Overdrive Guitar Contest champion The Toys Thunwa Boonsungnern. Nov 25, 6pm. Live Arena, RCA, Rama 9 Rd., 098-974-6974. Ticket B1,800 on Ticketmelon/ B2,00 on entry.